Sure, winter was cute, but we’re ready to slip out of a tracksuit and into a bikini (and a mimosa). Whether our bodies are ready for that or not is another story. Either way, you can start your social season right with our guide to the best coastal cafés in South East Queensland! Take their hand, and their whole life too. Hand of Fatima lives for a quality middle-eastern experience, offering unique breakfasts right by the beach such as warm lamb mince on hummus, smoked trout salad and kibbeh with crusted asparagus and shanklish! Delish. Little Boat is big on using fresh, seasonal produce in deliciously unique ways. We’d recommend the okonomiyaki green pancake with twice cooked pork jowl, fried egg and chilli and a Palm Springs cocktail – because a boozy brunch is the best brunch. Can confirm – not your average canteen. This joint is up and pumping every day of the week for breakfast, lunch and dinner, featuring seasonal menu offerings with firm favourites, such as the beetroot velvet latte and smashed avo. Can’t beat that. A Queenslander made its way to Miami, and the rest is history. Paddock is your foodie home away from home, where good (and very beachy) vibes resonate throughout. 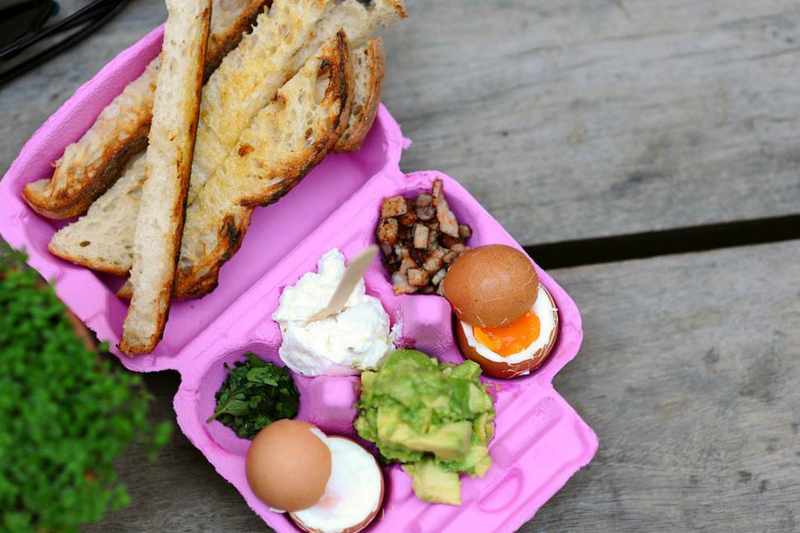 Their Insta-famous dippy eggs are to die for, as is the purple toast and breakfast in bread (literally a breakfast cob loaf)! We’re dubbing Cardamom the Cardi B of the vegetarian café realm – full of life with infectious quirks. Tackle an Indian street food waffle with roast pumpkin, potato peanut fritter, beetroot coconut yoghurt raita, tomato chutney, herbed aioli and Mumbai trail mix for a tip top time. Wham bam thank you ma’am. From their croissant French toast to their karaage chicken bowl, you’ll be all set for a beachside feast. Just make sure you wait 30 minutes before you swim! Also, did someone say Nutella milkshakes? Gotta risk it to get the BSKT. Your day and night time go-to serves the likes of burrito bowls, beef cheek, and hekkin’ breakfast banh mi. Cocowhip it good to complete your experience! There are plenty of fish in the C’s, but none quite like these. - the gourmand that could smash an avo right about now.